BestBackups' Memopal review, evaluating the success of their features, security measures, customer support and pricing. 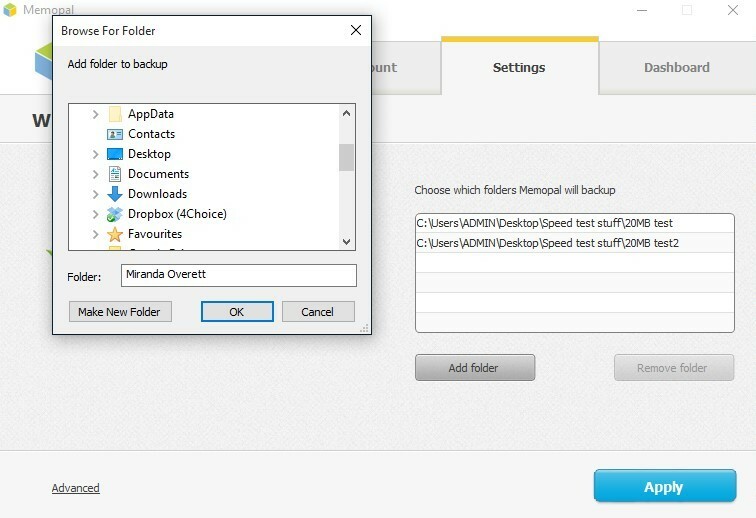 Flexible and extremely easy to use, Italian-based backup service Memopal is an appealing option for not just European users, but also those searching for a simple way to keep files safe online. You can read a detailed review below or sign up now. Memopal offers two personal price plans, as well as a White Label plan for business customers. Both plans allow users to access the full range of personal Memopal features, although the Free plan offers 3GB of storage space while the Pro version provides 500GB for €79 (approximately $87) per year. Users looking for a personal account primarily designed for sharing files and accessing data remotely may find that Memopal’s free version best meets their needs. Data can be backed up and accessed from an unlimited number of devices, and there is the option to earn additional storage space by encouraging others to join Memopal too. For every person that signs up on your invitation, you will both make 500 MB (up to a maximum of 10GB per user). If you are more interested in backing up large amounts of data, however, then the paid subscription may be a better option; although this plan can only be used to backup data from one computer. Subscriptions can be paid for using Visa, MasterCard, Visa Electron, PayPal or via a bank transfer. Compared to other backup providers that provide unlimited storage for around $60 per year, Memopal’s subscription price might seem a little steep. However, it’s clear that they are trying to make their product worth its price tag by providing a broad range of features designed to meet a diverse array of needs. Are they successful? We take a look below. Memopal began life in 2007, founded by Gianluca Granero and Marco Trombetti, both of whom boast successful records as entrepreneurs within the IT industry. Based in Italy, their small team now provides storage services to over 1 million people and maintains partnerships with a number of large companies. While most online backup providers automatically upload every file on your computer, and online storage solutions focus on storing and sharing individual files and folders, Memopal easily accommodates both approaches. To backup your entire system from their desktop application or website, you’ll simply need to click ‘custom configuration’, and then select ‘C:’. All files and folders on your C: drive will then be automatically backed up. There are no restrictions on the types or sizes of files that can be backed up, but all single documents exceeding 5GB in size must be uploaded manually. Memopal account holders can backup files from an unlimited number of different devices. As so many of us now own more than one way to work, check our emails, and watch Netflix (from laptops, tablets and phones to old-fashioned desktops), being able to back them all up to the same account without paying extra can come in very useful. Once you’ve decided which files to backup, Memopal will automatically update your cloud storage every time they are removed or changed. The software runs automatically from the moment your computer starts up and requires little to no input once setup is complete. Browsing through the desktop app’s advanced settings, you’ll find the option to change your backup schedule. You can choose automatic (whereby all changes are immediately uploaded to the cloud), daily or weekly, with the latter options also allowing you to select your preferred day and time. Memopal is compatible with Windows, Mac OS X and Linux, and its mobile app runs on Android and iOS. Those using Memopal’s free plan can backup and access files across as many different devices (and operating systems) as they like. It’s very easy to share files with Memopal – you can either right click on a backed up file and select ‘Share’, or drag a file into the ‘Share’ box on the desktop app. Both methods will generate a secure link, which can be copied and pasted to the location of your choice. There is no limit on the size or type of file that can be shared, but it’s worth noting that there is no way to password-protect links. Memopal also provide a synchronisation service that allows you to access backed up files from multiple devices, just by adding documents to a ‘sync’ folder. Memopal joins other providers including SpiderOak and ElephantDrive in offering unlimited file versioning. This is a process by which previous versions of your documents are automatically saved – allowing you to return to an earlier draft of your work should you need to retrieve information further down the line. With plenty of providers limiting how many versions can be saved or how long they are retained for, Memopal’s unlimited capacity is a big plus here. As well as versioning, Memopal will also hang on to files after you’ve deleted them from your hard drive. This means that you can use the service as a long-term storage solution – keeping files safe while freeing up space on your PC. As with versioning, this will eat into your storage allowance, but it’s an extra security measure; if you delete an important file by mistake, you can always get it back. You can also disable this feature if you prefer. To get an idea of Memopal’s upload and download speeds, we ran some simple tests. Starting with uploads, we manually timed how long it took for five individual files to transfer to the Cloud, then divided the number of MB in each file by how many seconds it took. We then converted our results into Mbps, applied the same process to five downloads, and recorded our findings in the graph below. As illustrated by the graph, Memopal’s average upload speed sits at around 2.1 Mbps, with a high of 2.9 Mbps. A 100MB file took just over five minutes to backup – slightly below the typical speed of other providers we’ve tested. Downloads were quite a bit faster, with an average speed of 3.8 Mbps – the same 100MB file taking around three minutes to complete. On the whole, there’s nothing to shout about when it comes to Memopal’s speeds, but nothing to be too worried about either unless speed is your top priority. The official line from Memopal is that your first full system backup can take as long as a month to complete. 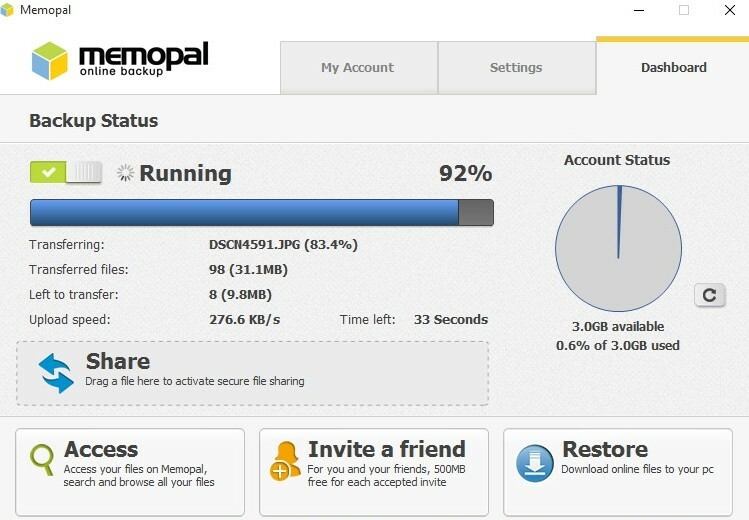 As backup services are often slow, this isn’t particularly unusual – but Memopal are going the extra mile in an attempt to make the process as painless as possible. They achieve this by using a system of prioritization based on file types and frequency of use. This detects which data is most likely to be important to you and backs it up first, so you can relax in the knowledge that your essential files will be safe within the first few days rather than waiting at the back of the queue. This is a nice idea, although it doesn’t work perfectly in practice – here at BestBackups, not all of our important files get accessed regularly, so didn’t make it into the first round of uploads. If you’re concerned about backing up your current projects first, however, it does come in handy. Memopal is an especially practical choice for users based in Europe, as its datacenters are much closer to home than those used by US providers. This proximity helps to speed up your upload and download times, making backups run more smoothly. The company also falls under the jurisdiction of the Court of Rome, Italy, which conforms to the EU’s Data Protection Directive. For those concerned about privacy, this is an advantage, as EU guidelines make it much harder for corporations and governments to demand (and receive) your data than in the US. Memopal’s security credentials are good, with plenty of detailed information about their standards and processes available online, and an extensive set of regulations in place to maintain user privacy. All data backed up with Memopal is protected with 256-bit end-to-end encryption, and transferred using a server-side SSL certificate – meaning that your files are locked up tight whilst still on your computer and remain secure until you decide to restore them again. The company also takes steps to reduce the risk of Man-in-the-Middle attacks by requiring clients to present a valid digital certificate before any communication takes place. In addition to this, Memopal also takes measures to ensure that no stored data can be connected to its author, by encrypting the data structures that link the two together and storing user registration data and files in different geographical locations. These security standards are maintained by Memopal employees as well – data cannot be connected to its author or accessed in any way by staff, even during system maintenance. In order to protect stored data against physical damage, Memopal run RAID 5 technology on their servers, and also developed MGFS – the Memopal Global File System. This allows the company to save your data across multiple different data centers in different geographical locations – meaning that if one should be disrupted or destroyed by a natural disaster, your files will still be safe in another. Memopal’s customer support options include phone lines in London and Rome, as well as a toll-free option for US users. All other enquiries and technical problems can be solved by submitting a support ticket. For more general information, you can turn to the Memopal YouTube channel, which features a few basic introductory videos, or to their FAQ, which contains around 45 practical questions and answers to help you get started. Don’t expect too much, however – questions are basic and a little repetitive, with an absence of any advanced topics or troubleshooting advice. Having sent off a support ticket of our own, we were very pleased with the speed and quality of Memopal’s response. Within four hours of submitting our request, we received a friendly and detailed reply that gave us all of the information we were looking for and clear directions on how to find out more. They also invited us to respond to the email should we have any further questions – a nice touch and much easier than creating a new ticket. Memopal doesn’t have a blog, but it does maintain profiles on Facebook and Twitter. Though updated regularly, the accounts are mostly commercial by nature, promoting Memopal products, posting company updates and occasionally reposting external articles on backups and internet security. There’s not much interaction with customers, and very little technical advice to be found. Memopal is easy to download, and the 7.7MB installation file gets up and running in no time. During setup, you have the choice to start by automatically backing up My Documents, or to make a custom selection of files (although if you’re not sure at this point, it’s easy to change this later on). As soon as the installation is finished your selected files will begin to upload – the process running in the background until they are all securely backed up to the Cloud. The majority of backup information can be found on the Memopal app Dashboard, which displays the progress of any files currently being uploaded, as well as showing how much of your storage allowance has been used so far. There are also shortcuts for sharing and restoring files, and a quick way to invite your friends to join Memopal. The interface is appealingly simple, and all functions are quick and intuitive to use. When you want to backup a file or folder, just open the application’s Settings tab and select the data you want to add. There’s nothing complicated here – Memopal uploads are extremely simple, and would be quick and easy for even the most inexperienced user. In Advanced Settings, you can add proxy settings, cap your upload speed, change your backup schedule or impose a limit on the size of files that are automatically uploaded. It’s not the most advanced set of options, but should certainly be enough for most users to customise Memopal to meet their needs. Retrieving backed up files from Memopal is another straightforward process. Unlike with many other providers, you don’t need to visit the company’s website, check your emails or worry about unzipping files. Instead, just open the desktop app and select ‘Restore’ from your Dashboard. A box will pop up showing all of your uploaded files (you can also choose whether or not to view documents that have been deleted from your computer hard drive), and all you need to do is select the desired file or folder, specify your preferred destination, and wait. We really appreciated Memopal’s flexibility in this regard, as so many providers make restoring files into a long and convoluted process. For those looking for speed and simplicity, it’s the perfect answer. You can upload files and download and share backed up data from the Memopal mobile app, which is (once again) easy to understand and use. To upload an image, video or audio file just select it from the file explorer that pops up, and the backup will begin immediately. To retrieve a file, highlight it, wait and (so long as the file format is supported by your device) you’ll be able to open it as soon as the download is complete. Sharing files is simply a matter of choosing your platform – email, Facebok or Twitter – and letting the app post the link for you. Unfortunately, uploads and downloads do not run in the background, so uploading and downloading larger files will effectively render your phone useless until they finish or are cancelled. Fortunately, we found that photos and even videos transferred relatively quickly, so you shouldn’t be out of action for too long! Memopal is an appealing and versatile backup service that grants users a reasonable amount of flexibility while remaining simple and easy to use. Although customer service options and full system backups fall short of expectations, there are a good range of features on offer – making it an ideal choice for anyone looking for a good all-rounder. Those based in Europe will also benefit from faster file transfers. As of now two years user of Memopal (with Debian 7 and 8). No complaints at the moments. Works silently on background, and saves the files without delay. Linux interfaces does not has the bells and whistles as other OSs, bur the browser interfaces are more than enough. I’ve used several cloud services (including Dropbox, SpiderOak, Wuala and Tresorit). Memopal is really the humble but very efficient service anybody would like. On pair with pCloud: different, but not worse than it. Only hoping long life for this service (Wuala was good too, but one year ago closed). I’ve been using Memopal on Windows for at least 6 years (started in 2010 or earlier, it’s now 2016). All I can say is that my files have always been safe and available for those years, so I’ve always slept soundly and never wanted to switch services. The one thing that’s inconvenient is changing your registered email address–you have to email their customer service personally to request the change. What do you think of Memopal? Leave a comment with your thoughts.